Cruise Planners Franchise Reviews - Legit or Scam? Cruise Planners Franchise – Legit or Scam? 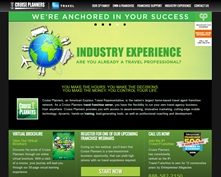 Cruise Planners Franchise, found online at CruisePlannersFranchise.com, is a franchise opportunity for people who are interested in running their own independent travel agency business out of their home. A franchise is an independently owned business opportunity where the owner pays fees for using the knowledge, business practices, and other proprietary information of an already established business. The Cruise Planners Franchise website says that they are one of the most successful, affordable franchises currently available on the market, with just an initial investment of $10,495 required. The Cruise Planners website says that their opportunity is perfect for people with no travel agency experience, because they offer you a six day training program with your franchise purchase so you are prepared with how to best establish your business and interact with your corporate support team. They encourage their newest team members to begin running their business part time, so they can ease into their industry and become comfortable with company policies and practices. Cruise Planners Franchise promises their newest franchise owners that this is an incredibly easy franchise to be successful with, as they have been successful for more than 20 years and the cruising industry has seen growth each year for the last 30 years, including double digit growth in the last ten years. In fact, they says that the travel industry is a recession proof industry, perfect for someone interested in owning their own business. As an affordable franchise opportunity that is partnered with the American Express Travel organization, Cruise Planners probably could be a very decent independently owned business opportunity. Unfortunately, there are a lot of problems with the way this company promotes and sells this opportunity. Claiming that someone with no experience in the travel industry should feel no concerns with owning a travel agency is ridiculous, but not nearly as ridiculous as claiming that travel is a “recession proof industry,” when travel is in fact one of the very first and very hardest hit industries during times of economic trouble. Another issue not being addressed by this company is the fact that travel agencies have been an industry almost eradicated by the internet, since most people make their own travel plans online or use mobile applications and websites to find the best prices and itineraries for their needs. The truth is that this franchise opportunity may not be a bad idea, however it is impossible to know that or trust that since their sales page spends so much time directly lying to their potential franchise owners. Cruise Planners Franchise Reviews ? Average Rating for " Cruise Planners Franchise Reviews " is 2.2 out of 5 based on 5 reviews. You noticed that they never get around to telling you about the host agency.... its because they are full of it. there people put on these sites to talk bad about competition businesses. it is very expensive to put together on your own all the things you need to run the business.. that is what you pay for. If you are serious about any business don"t listen to dummies on sites like this. I have done well in my business but it takes work like anything else. If you want to compete and make money you will need all the marketing and support and there is no way a company can give that to you for 400 dollars a year. You will put out 10 k one way or another or you won't sell anything. You get what you pay for if you got to one of those "host" agencies who just charge $100 or so a month trust me you won't be getting the training and technology that Cruise Planners offers there is a reason the franchise for zero experience people is 10k. Think about it people you get what you pay for I don't care what anyone says and I'm an experienced over 20 year agent. I was choosy when I left the inside sales travel job I had. I did not pay that huge fee but I have experience. It takes a lot to train people to sell travel no it isn't rocket science either I went to travel school when it still existed and that was over 3k. It is work to market yourself networking and advertising etc. It takes money to make money and you need to be self motivated and have some drive. This isn't just a travel for perks job. Clients aren't always happy. My (2) cents. I am with a Top 20 host agency and I can truly tell you the commission are supposed to be 70+, but they are not. The reason is because you are not going to be in it on your own, you will have an owner over you who will eat the difference in commissions, plus what the host takes out off top. The person I worked for got a cut from all 20 agents under her. Nevertheless, Because I too, am a consumer...I went through Agents website for Host Agency claiming to be #1, for my TOP 5 Host Agency I'd franchise with. NO GO FOR ME'. I am very tech SAVVY & need a Franchise that is on top of the NEW Age Changes. Just because you allow a client to book one thing, doesn't mean you fit the bill as being a bookable site. I don't need an agent to, but love those sites that don't restrict me to only book with an agent. My clients are the same way. Because of this fact and several others that matched my Top 5 must haves, as well as speaking with other female Franchise Owners of Cruise Planners,I'd say I'm not disappointed. I am truly a person who has that 'DRIVE' individually, and can't wait for the journey. I love the product & the technology with it's booking capabilities. It is an extra charge for that, but, I am willingly going to pay $59.00 for my clients to have the capabilities to book their trips online..
BTW, I am with a top 20 Host agency as a regular TA, and I have to pay $60.00 a month for a site, that only allows the clients to book hotels ONLY...Nothing else and it doesn't even report commissions for you...Funny, but This is the website set up by the host agency. Next month, I will be a full Franchisee. I would love to have this follow up conversation this time next year. I started 5 months ago as an TA with a host agency and have booked over $20k already in sales, however, my commissions are minuscule, and you get no leads or marketing material personalized for you. But hey, Keeping it REALLY OPTIMISTIC & I'm Ready to Rock! My apologies I can't rate it as an owner right now, but based off what I have seen as a customer, I'd give it a 5. Where is a good place to get in with host agency? One that provides training, website, Brochures, all tools needed. Hi, I looked into this whole Cruise Planners Franchise thing and honestly think it's ridiculous to pay them $10K. But, I don't know what a host agency is. Please enlighten me so I can look into it. Thanks a bunch! I owned a CP franchise and I would recommend anyone to DON'T DO IT! A complete SCAM their tools are out dated, selling franchises is how they make money not selling travel. Buyer Beware! Right what is the host agency that is referred on this site..
John, I googled "travel host agency what is" . It appears that you can work at home and maybe book travel for friends and family. A host agency would do the bookings for you and hence pay you the commissions. In this instance, you would be an affiliate of the host company and they will give you a commission for each trip you book. I have an online shopping mall and am affiliated with many companies that give me a commission. Getting more than a 10% commission for each sale is rare. Can you explain more about this? I was looking into buying a cruise one franchise. Cruise Brothers is but one of many. Do you have a name of a bona fide host agency. I am interested.